This sticky rice dessert is super-easy to make, yet looks and tastes very gourmet. A great make-ahead dessert to serve guests, this sticky rice treat is also a healthy low-fat dessert recipe (both gluten and lactose-free!). And there's no baking or steaming involved! - simply boil up a pot of sticky rice, mix it with a few Thai ingredients, then press it into a pan and let it sit overnight in your refrigerator. Serve cold or warm along with a topping of coconut milk and some fresh fruit. Mmm...! First, make the sticky rice according to the directions given in my: How to Cook Sticky Rice, Step by Step. While rice is cooking, prepare the cake pan (standard 8 x 8 size). Generously grease the pan (including the sides) with a little cooking oil, such as coconut or canola oil. Set aside. After rice is done cooking (or "steaming"), remove the lid from the rice pot. Add 1/2 cup sugar plus 3/4 cup coconut milk, stirring both well into the hot rice. Quickly taste-test rice for sweetness, adding up to 1/4 cup more sugar if not sweet enough for your taste. Note: Palm or brown sugar may be used, but this will turn the rice slightly brownish in color. Now scoop 1/3 to 1/2 of the rice into your square cake pan. Be sure to replace the lid on the rice pot immediately, as the rice needs to stay hot for these steps. Grease the underside of a spoon and use it to smooth out the rice, pressing it into the bottom of the cake pan. This is the first layer of the rice cake. Try to make the rice as flat and even on top as possible. Of the remaining rice in the pot, scoop out half into a mixing bowl, once again replacing the lid on the rice pot. Add a couple of drops of the pandan paste, and quickly stir to blend it into the rice. This should turn the rice a light green color. Using the same technique as before, gently press and smooth this light green rice over the white rice in the cake pan to make the second layer. Try not to press too hard as you distribute the green rice, or you will disturb the first layer. 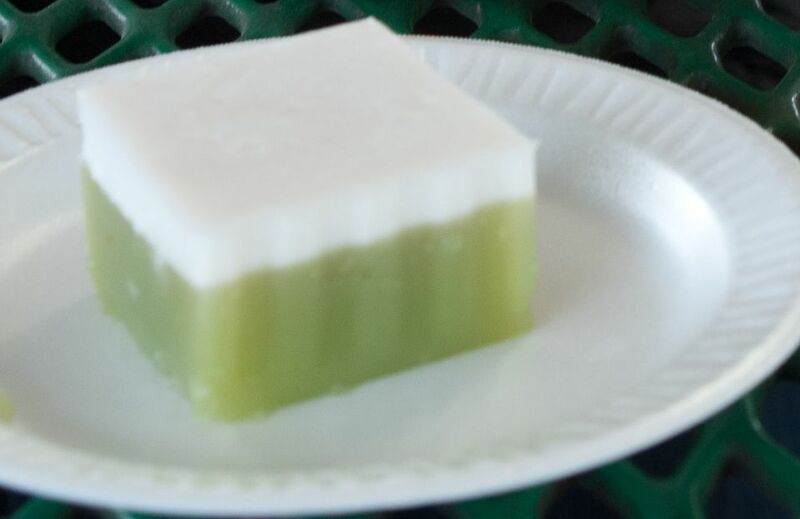 To the rice remaining in the pot, add 5 or more drops of the pandan essence, or until the rice turns a noticeably darker shade of green (than the previous layer). Tip: Darker will give you better contrast and be more striking when it's done. Now add this rice as the final layer. You need to add this layer gently and carefully, or it will blend with the previous layer. Smooth out the top and then cover your cake pan with tin foil and refrigerate several hours, or overnight (the cold will firm up the dessert). To make the coconut sauce, depending on how many guests you're serving, you'll need 1/2 to 1 cup good-quality coconut milk. Place coconut milk in a sauce pan and warm up (but don't boil). Add sugar to taste, stirring to dissolve. Now add the cornstarch dissolved in water (1 tsp. for a 1/2 cup coconut milk; 2 tsp. for 1 cup). Stir over medium heat until sauce thickens, then remove from heat. To serve the dessert, grease a serrated knife or run it under some boiling water (to keep knife from sticking). Cut squares of the rice cake and carefully lift out of the pan, placing them on serving plates (I like geometrical designs made up of several smaller squares, as pictured). Microwave the cakes briefly, as this dessert - like many Asian desserts - is best served warm. Then pour coconut sauce over, and garnish with a few raspberries. ENJOY! Tips: This dessert is a superb one to make for a dinner party or any social gathering, since you can make it the day before. Just be sure to eat it up within a couple of days, as sticky rice tends to dry out quickly and harden.